The “Ship or die”, “Done is better than perfect”, “Just ship” mantras have lately become a part of many startup conversations. The problem with these mantras is that they glorify the act of shipping while ignoring the fact that shipping is only the means to create value but not the ultimate goal of a startup. Unfortunately, repeating these mantras might have a dangerous effect. The “ship it” mentality leads many startups to do mediocre, incremental, non-important work. There’s a reason why the concept of shipping it became so pervasive. No, I’m not talking about Zuck posting pictures of internal Facebook posters on his profile although this might have an effect on younger startups. The main reason is that shipping feels great. Heroic even. Something you’ve worked on actually gets deployed and people start using it. It gives the whole team a sense of progress. Sometimes, a false sense of progress. Shipping might also be useful when you want to quickly test an idea or a small feature. It helps you solicit feedback very quickly. Sometimes, the wrong feedback. Shipping the wrong thing — if you didn’t think through the product/feature you are shipping, you might end up shipping the wrong thing. This will not take you anywhere, no matter how fast you ship. True, you might learn faster that you shipped the wrong thing and correct your course but you might also have feedback that can lead you astray. Shipping a mediocre product — the biggest problem with just shipping is that it many times comes at the expense of quality. It results in products that are not well thought through. As a result, even the feedback you are getting is not complete since it addresses the weaknesses of the implementation versus the actual idea. This s-shaped graph shows the increase in impact you have when you invest more effort into the quality of your product. 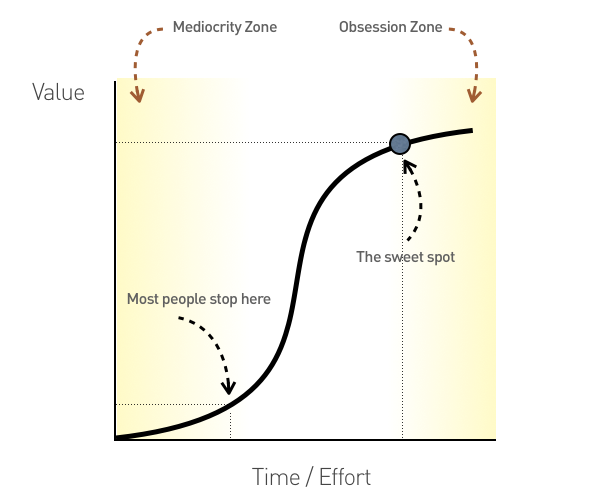 The big idea behind this graph is that you can achieve a 10X improvement by putting additional time, effort and energy into your work, up until a certain point. The returns on the extra work are so much larger simply because most of your competitors will stop way earlier. They will solve the problem in the easy, but probably most basic way. When you first start off trying to solve a problem, the first solutions you come up with are very complex, and most people stop there. But if you keep going … you can often times arrive at some very elegant and simple solutions. Most people just don’t put in the time or energy to get there. We believe that customers are smart, and want objects which are well thought through. The biggest pushback on quality focus is that as a result you are moving slower. Our experience taught us that this is far from being true. What happens many times when you ship something fast is that you have to go back and fix it. And then fix it some more. The overall time you spend on doing that eventually takes longer than what it would have taken to do it right the first time. Don’t get me wrong. We are hyper focused on creating value for our customers. We have a sticker on every computer reading: “It’s null till you ship it”. However, we are making an increasing effort to ship less features of bigger impact than many small ones that have minimal incremental value. Facebook’s “Done is better than perfect” is a nice mantra. Internally, we tried to come up with a tradeoff that represents our own philosophy. We ended up with, “Less, but perfect”, which is also a play on Dieter Rams’: “Less, but better”. There is a reason why it took Dropbox 18 months to launch. Evernote spends probably twice as much building native client applications instead of simple mobile web ones. Path 2.0 got so much attention because it was just 10X better than anything else in the market. Square obsesses on quality. It took Quora three months to figure out only the question page. It is not a coincidence. Eventually, the better products, the ones well thought through, prevail. Especially in ecosystems where the switching costs are non-existent and marketplaces are won by better rankings.